There's a reason she's been dubbed as the Queen of clapbacks. 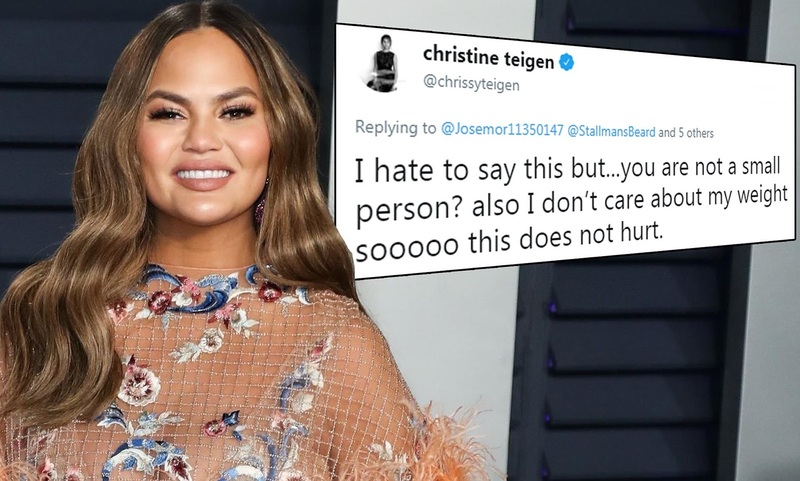 And Chrissy Teigen sure made that reason known when she took to Twitter to hit back at a troll who called her 'chubby' and a 'fatty' on Monday. The 33-year-old kindly told the hater to bugger off before confessing his words didn't affect her as she 'doesn't care about her weight'. 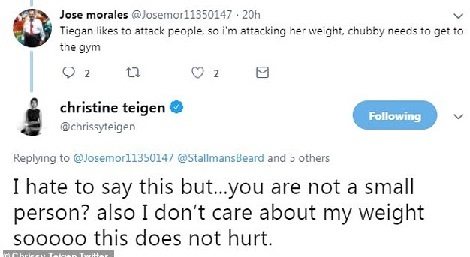 'Tiegan likes to attack people, so i'm attacking her weight, chubby needs to get to the gym,' wrote a troll named Jose. And it wasn't long until Chrissy put him in his place. And it's not the first time Chrissy has found herself having to defend her weight. '"how do you eat like this??" - basically I am 20 pounds heavier than I was before miles,' she began.